The first installment in the Hometown Antihero series by Amber Lynn Natusch. When her FBI agent father is framed for murder, Kylene is forced to move in with her grandfather, back to the small town that turned its back on her, and the boy who betrayed her. All Ky cares about is clearing her father’s name, but someone won’t let her forget the photo scandal that drove her away two years ago. As the threats gain momentum, Ky finds an unlikely ally in the annoyingly attractive rookie FBI agent sent to keep an eye on her. Determined to expose the town’s hidden skeletons, Ky unwittingly thrusts herself into a much bigger plot. They thought she’d forgive and forget. They’re about to learn they messed with the wrong girl. DARE YOU TO LIE, a young adult mystery read perfect for fans of Veronica Mars, Pretty Little Liars, or Riverdale. The last thing Kylene ever wanted to do was return to Jasperville, but that’s exactly what she has to do after her father is wrongly arrested for murder and her mother moves across the country. Returning to the high school that shunned her after the photo scandal ruined her freshman year proves to be as difficult as she expected it to be. Between getting her car windows smashed, threatening notes, a brick thrown through her house’s window, and almost run off the road, someone does not want her back in town reopening closed cases. However, Kylene isn’t about to just sit around and let whoever posted the photos in the first place get away with it again, especially when the clues she discovers start connecting to her father’s case and other criminal activities in the area. Kylene is so much like Veronica Mars—she’s sassy, feisty, bitter, and not going back down from a fight—and I really loved that about her. She’s tough, loyal, and ready to stay firm in her beliefs. When she arrives back to school, she’s quick to reconnect with her old best friend, Garrett, and make friends with the new girl, Tabby. We definitely see more of Garrett than Tabby, but I enjoyed uncovering the backstory Ky has with Garrett and how supportive he is of her. With those two by her side, Ky faces down Donovan, star football player and one of The Six accused but never charged for the photo scandal. It turns out his aggression and anger is connected to more than just normal teenage hormones, and Ky is determined to uncover every little secret in order to find the key to unlocking her case. There’s a whole slew of other characters in Ky’s life that all have her back. We have her grandfather who has taken her in, her mother’s best friend Meg who is also an attorney, her father’s old FBI partner Striker, and her father even though he’s in prison. With all these people on her side, Ky’s able to dig deeper into the case and discover surprising clues. While Ky does have all of these people supporting, it definitely felt a little unnatural that her mother never checked in with her. The mystery as a whole is really intriguing, and while part of it is solved by the end of the book, that is just the tip of the iceberg and more is promised to come in the sequel. I loved how fast the story seemed to move. There was always something going on and by the end of Ky’s first week back, I was surprised that a longer amount of time hadn’t passed with everything that went down. When the mystery itself isn’t focused on, the novel still feels like it’s moving forward with the quick and witty dialogue. Overall, fans of Veronica Mars will love Dare You to Lie! I can’t wait for the next installment! AMBER LYNN NATUSCH is the author of the bestselling Caged series for adults. She was born and raised in Winnipeg, and is still deeply attached to her Canadian roots. She loves to dance and practice Muay Thai―but spends most of her time running a chiropractic practice with her husband, raising two young children, and attempting to write when she can lock herself in the bathroom for ten minutes of peace. Dare You to Lie is her debut YA novel with Tor Teen. 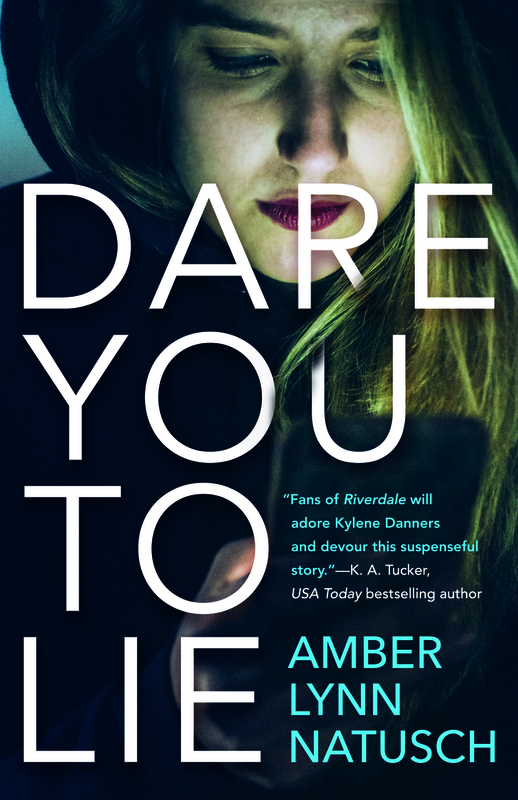 To celebrate the release of DARE YOU TO LIE by Amber Lynn Natusch, we’re giving away a $25 Amazon gift card to one lucky winner! GIVEAWAY TERMS & CONDITIONS: Open to internationally. One winner will receive a $25 Amazon gift card. This giveaway is administered by Pure Textuality PR on behalf of Amber Lynn Natusch. Giveaway ends 9/18/2018 @ 11:59pm EST.